The legendary watchmaker IWC, which is a staunch supporter of the program Laureus Sport for Good (the Fund’s Laureus), beginning in 2009, each year produces special watch, on the back of which is engraved children’s drawings. Although this year the brand IWC has released the original Portofino Chronograph Blue Foundation for Laureus, she also recently participated in a charity Laureus Switzerland to collect donations. Mark donated to a single instance of Pilot models with perpetual calendar. The Foundation has collected more than 350,000 euros, with some only hours made an impressive amount of 116 000 euros. 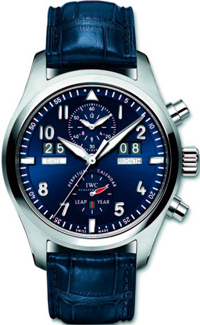 Hours are based on a model of IWC Spitfire Perpetual Calendar. The difference is in the Company’s traditional Laureus blue and housing, with a diameter of 46 mm. Housing is made of platinum. Transparent window on the back side of the case allows you to monitor the rotor caliber silhouette Spitfire, engraved inscription «Laureus Charity Night Zurich 2012″ and engraved serial number.